Central design of large vase of flowers. 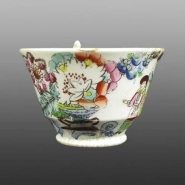 Bone china teacup with a black printed pattern depicting Chinese-style figures in a garden landscape. On one side a woman with a parasol stands with a child, on the other side a seated woman plays a stringed instrument, between the two prints is an over sized urn with a large floral arrangement. The whole is coarsely painted in blue, green, red and yellow enamels. The name appears to have been misspelled in the mark for documentary evidence shows it to be Shelley & Shaw. 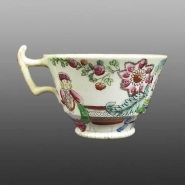 This appears to be the only identifiable example of work from this factory, which has normally been recorded as an earthenware pottery.